I’ve just received a copy of the new reprint of Wm. 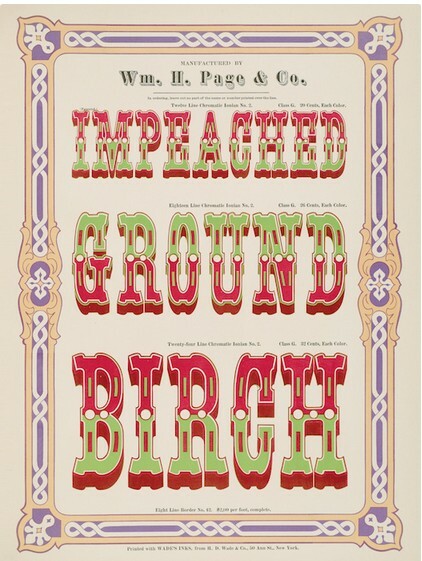 H. Page’s 1874 Specimens of Chromatic Wood Type. It is really gorgeous! hardbound 10” x 13” format, 120 pages, every one of them in full color. The pages have been reduced to 65% of the original, but are still large. It’s selling for $28.46 at Amazon and other dealers, and I consider it a great bargain. Thank you for posting this, Stephen! Yes indeed. My copy’s purchased. YES…THANKS!!! Just ordered up our copy and it’s on the way!!! Great Book! Received mine today from Amazon. As well as being a work of art, it will help me to interpret the past in the 1860’s +/- print shop, at Westfield Heritage Village, where I volunteer. When we print with colors other than black, people often ask if they had colored inks back then. Thanks Steve and THANK YOU Esther!!!!!! My copy will be arriving this week. I never expected to see a copy of this classic in my own library. Speaking of expensive books, I bought a copy of When a Printer Plays by Richard Hoffman thirty some odd years ago. I bought it new directly from him. Probably paid less than $100 at the time. One of the favorite books in my library. I mention this because part of the APA Wayzgoose in LA in July will include a talk about Richard Hoffman. This reminded me to pull out the book and go through it again. I then looked it up and it now sells from $700 to $750 a copy! I purchased my copy through Barnes and Noble and received excellent service rather than going through Amazon. It is a finely crafted book. The cover is a combination book wrapper plus a sort of hard cover not quite a hard cover. I plan to create a paper dust jacket to protect what other wise will be an easily damaged/soiled cover that with its foil stamping and embossing is truly very dramatic. I found most of the letterpress related articles on this web site to be somewhat shallow in that they were, surprise, written by collectors rather than printers who would have known the subject better. My copy arrived today. Holy Moley!!!!!!! FANTASTIC!!!!!! Couldn’t be any better. Many thanks to everyone that made this reprint happen. Fritz - I have a large format art book about J.C. Leyendecker book from the 1970s. It too is fantastic. Aside from letterpress printing, back in the day I started professional life as a designer/illustrator. Howdy all and thanks for the link, what a great resource. I got a copy. Corner of book damaged. Not real happy with the fact it was printed in China. That is a slap in the face to some of the capable printers in the USA or U.K.